Wisteria can be found in practically every Amish garden here, and probably influenced the local Amish maker of this quilt. Note how carefully the fabrics were selected. Take a special look at the subtle background print. 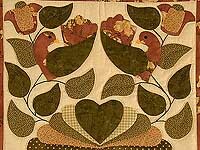 Great applique work and quilting. 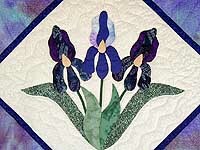 A wonderful quilt for purple lovers! Includes a pocket for a hanging rod. 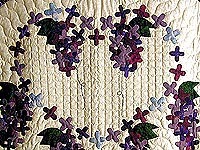 It is hard to find an appliqued quilt with such sophisticated coloring -- soothing and smooth! Excellent applique work, very good stitching. Made in local Amish home. Includes hanging pocket. This Iris wall hanging is a popular one here in Lancaster, but I don't think I've ever seen such wonderful fabric selections for the borders! It really sings! Careful thought also went into the choice of quilting patterns. I love the fleur-de-lis around the iris! And it is all very well worked. This lovely combination of purples and teals will enhance almost any home. There is a rod pocket for hanging.